WASHINGTON — If you don't like what they're saying, change the conversation. Or, in the case of President Donald Trump's campaign, produce your own news series. In the fight against what Trump has decried as "fake news" about him and his administration, his team has launched its own version of events: Taking the president's frequent laments about a lack of media focus on jobs, the stock market and the economy and turning it into a weekly video posted to Facebook focusing on just that. "More great economic news on Friday," former pro-Trump cable news commentator Kayleigh McEnany says, seated in front of a blue Trump-Pence themed wall to give "the real news." McEnany rose to political prominence during the 2016 election for her fiery exchanges in defense of Trump on CNN. She left the network this weekend, a source with knowledge of the situation told NBC News, asking to leave in order to pursue another opportunity. Her debut came shortly before she was named a Republican National Committee spokesperson on Monday. "I’m eager to talk about Republican ideas and values and have important discussions about issues affecting Americans across this country," McEnany said in an RNC statement on Monday. 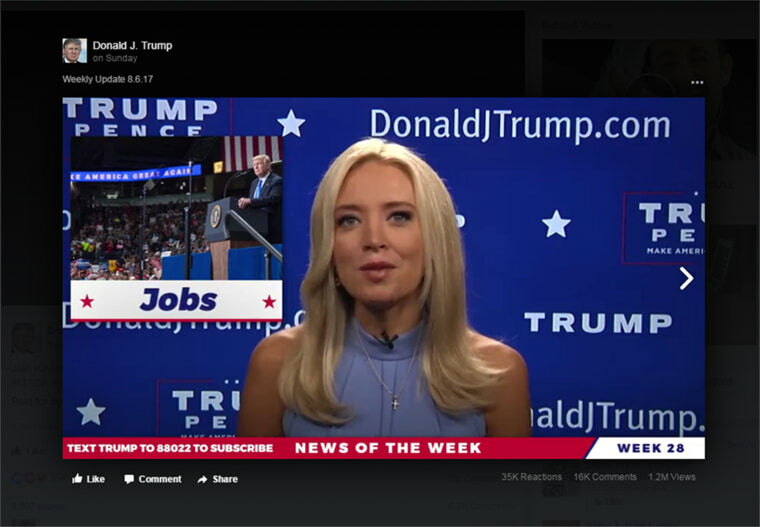 Her kickoff on what could be called "Trump TV" was shared with more than 22 million Facebook page followers and on Twitter. Trump's presidential campaign committee is listed as having paid for the news spot. The Trump campaign did not respond to a request for comment. The White House deferred to the campaign. The news episodes that were created by the Trump campaign — complete with the details that network news broadcasts use, such as over-the-shoulder graphics — make no mention of the Russia investigation, and promise "nothing but the facts." The focus of the two episodes so far has been "jobs, jobs, jobs," the administration's crackdowns on criminal gangs like MS-13, and the president's donation of his salary. "I bet you haven't heard about all the accomplishments the president had this week because there's so much fake news out there," said Lara Trump, the president's daughter-in-law, in the series' first video in late July. In the first episode, she proudly declared: "The economy is booming, ladies and gentlemen." "This tactic isn’t new," RNC spokesman Ryan Mahoney said, referring to the Trump campaign's videos. "Campaigns use video to get their message out all the time." Lawmakers also often employ the same tactics. Former Democratic presidential candidate Sen. Bernie Sanders, for example, has a talk show on Facebook Live. Presidents who get their side of the story out there may not be new, but political experts worry about the practice. "When a government starts reporting and phrasing things as real news, that's the time to worry that you're being lied to," said Robert Shapiro, a Columbia University government and politics professor. He pointed out that in this instance, the statistics and articles McEnany was presenting "were perfectly accurate and truthful." "But it basically accentuates the positive," Shapiro added. "And to get a fuller picture, obviously which includes a lot of the negatives, you have to rely on free press for that." The video also reminded some of something much darker. Former U.S. Ambassador to Russia Michael McFaul tweeted that the video felt like "state-owned channels." Shapiro noted the video series "smacks of the kind of thing that was done in Nazi Germany." Trump's social media prowess has been a critical piece of his political rise, propelling news coverage of him throughout the 2016 campaign, and even now as president with his frequent early-morning tweet storms. White House advisers flaunt the president's social media reach, calling it his way of reaching out directly to the American people —and his base, a group highly skeptical of mainstream media and reporting about Russian meddling in the 2016 election. In a June briefing, a White House spokeswoman, Sarah Huckabee Sanders, told reporters that social media gives the president "the ability to speak directly to the people without the bias of the media filtering those types of communications," She reminded listeners of Trump's "over 100-plus million contacts through social media and all those platforms." Many of his supporters appreciate that sense of a direct line to the president. "I love his tweets. Guess what? We know exactly what he's thinking," Trump supporter Laura Lee Oenick said in June at a Trump event in Cedar Rapids, Iowa.